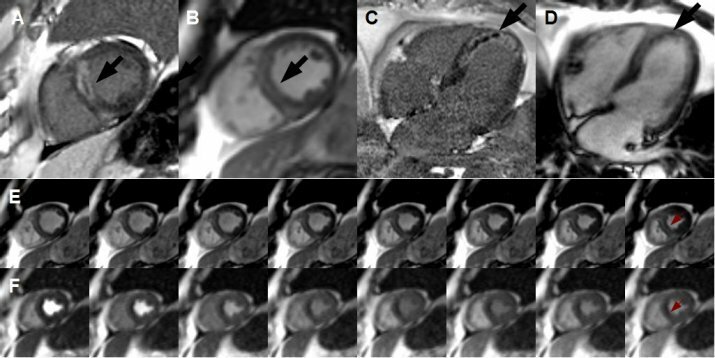 Cardiac magnetic resonance (CMR) imaging is the standard tool for the visualization of pathological processes within the myocardium like myocardial infarction, myocarditis and cardiomyopathies. Numerous studies have shown that CMR is the most reliable method to determine infarct size and tissue perfusion as well as contractility in one session having crucial impact on prognosis. Furthermore, CMR is applied for examining myocardial viability after infarction and for staging cardiomyopathies. At the moment research efforts are made to assess myocardial tissue in risk patients with coronary heart disease (CHD) before infarction. For that purpose, the heartrate is increased by injecting drugs like dobutamine and adenosine. In many CHD patients, myocardial perfusion is normal during rest, but shows impairments during exercise resulting in thoracic pain, when CHD is progressed. This situation reflects a coronary artery stenosis permitting sufficient perfusion during rest, but limits the blood supply during exercise. At the begin of the disease, CHD patients suffer from reduced fitness leading to a decline of activity. A combination of CHD associated with an accumulation of cardiovacular risk factors and reduced activity impairs also the performance of myocardial mitochondria, the power plants of each cell. These processes cause a vicious circle ending in myocardial infarction. Stress CMR is performed to measure myocardial contractility and perfusion as well as late enhancement. These parameters permit to assess whether exercise induce myocardial ischemia. However, the administration of drugs like dobutamine and adenosine for stress CMR can be acompanied by complications like contraindications, side effects and non-responders. Furthermore, the drug-induced load is not physiological and, therefore, hard to compare to daily situation which must be coped by each patient. In contrast, the use of an ergometer which produces a physiological stress, is comprehensive. Ergospect GmbH is known for constructing high-level ergometer, which can be operated within the tube of the MR scanner and during the MR measurments. This is the most important feature to permit an investigation of the myocardium during a constant steady-state workload. Already existing competitive ergometer do not support exercise testing within the tube of the MR scanner. Another indication for stress CMR is postoperative monitoring of patients with congenital heart defects. Even after operative correction, these patients suffer from hypertrophy of the left and/or right ventricle depending on the defect. Moreover, the circulation can be hampered by remaining stenoses or newly occurring stenoses of the aorta or pulmonary artery. Therefore, postoperative monitoring often comprises flow measurements in the large arteries of the thorax. However, a realistic assessment of relevant impairments of the circulation requires an examination under workload, which can be achieved by a moderate exercise using our devices.